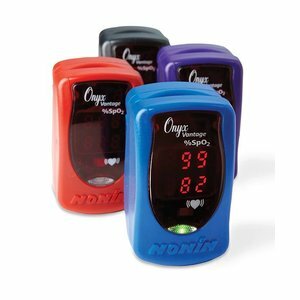 The Onyx is the only finger pulse oximeter with scientifically proven accuracy and is tested for use on fingers, thumbs and toes. -Proven Accuracy: Scientifically proven accuracy in the widest range of patients. -Reliable Results: Accurate readings on challenging patients due to low perfusion and darker skin tones. -Tested in motion. -Versatile: Units work on pediatric to larger adult patients and can be used on fingers, thumbs or toes. -Cost Efficient: 4-year warranty and up to 6,000 spot checks on two AAA batteries. -Clinician-facing, easy-to-read, bright LED – SpO2 and pulse rate can be read from any angle, in all lighting conditions, day or night. 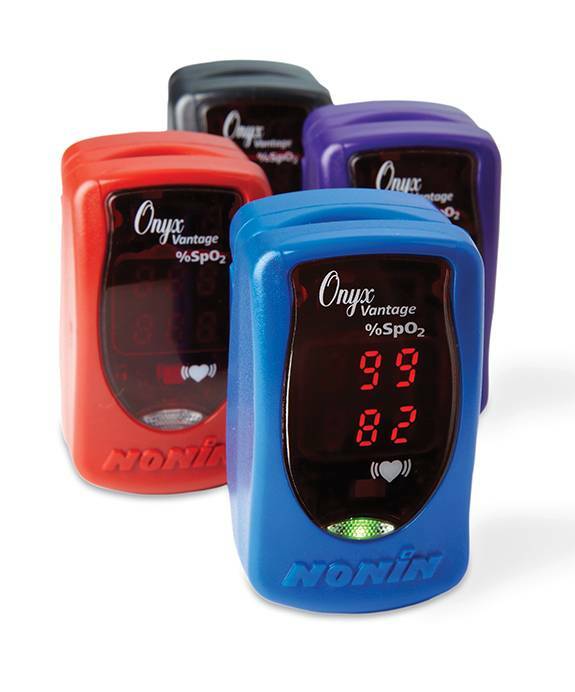 -Three-color pulse quality indicator LED – Green, yellow or red light provides a quick assessment of patient pulse quality. -Accuracy in the widest range of patients and conditions (Only Nonin uses PureSAT® SpO2 technology) an intelligent pulse-by-pulse filtering to provide accuracy in situations that are challenging due to dark skin tones, low perfusion and more. -One product for pediatric to adult patients: Automatically adjusts to each patient from pediatric to adult quickly and accurately and accommodates fingers, thumbs and toes with digit thicknesses 8 mm to 25.4 mm (0.3" to 1.0"). -Proven durability : Onyx Vantage is tough enough to withstand a minimum of 50 drops, is rugged enough to be used in the most demanding situations and exceeds IP32 water ingress testing. -Automatic turn on and off : No on/off button! Just insert digit for fast and easy spot checks. The auto-on/off mechanism allows two AAA batteries to provide up to 6,000 spot checks before being replaced! -Portable: Take the Onyx Vantage anywhere — it is lightweight and weighs less than two ounces. -Available in four colors : Black, Red, Blue and Purple. -Complete: with lanyard, instructions on CD and two AAA batteries.